Please check out our Security Camera Section for similar products!!!! The CAModulator makes it easy to add video cameras that you can view on any TV anywhere in your home. Unlike most cameras that require a cable for the power and video signal, there is only one connection at the video camera, the coax cable. Simply install in a single-gang J box or dry-wall mud ring. Then, attach a RG-6 coax cable and 2-way combiner into the TV/cable distribution coax. The built-in modulator allows you to inject the video camera signal directly into the TV/cable coax system on an unused cable or antenna channel. The power supply can be located at a convenient location away from the camera since the power is transmitted over the coax cable itself. The CAModulator has a bendable bracket so you can adjust the viewing angle of the camera. Includes two Decora lens (clean and tinted), power injector, and 12-volt DC power supply. (Decora wall plate sold separately.) One-year warranty. Perfect for residential security monitoring applications. Use CAModulator to monitor customers, employees, or equipment at retail stores, schools, hospitals, warehouses and more. 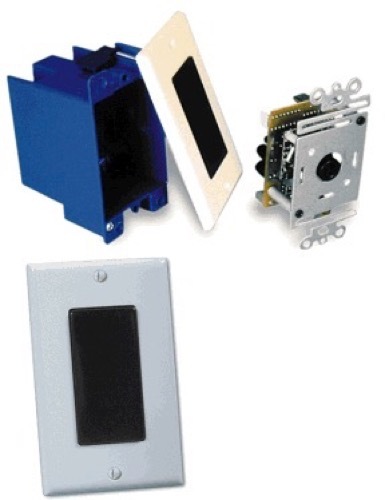 Install at your entrances for security to see approaching visitors or intruders at your home, business or apartment. Use your CAModulator as a baby cam to view from any TV in the home. Monitor children playing outside, or check on animal kennels and stables from the comfort of your home. The CAModulator differs from other surveillance in that the camera signal is already modulated so every TV in your home can receive the signal without additional electronic equipment. You select the channel from 14 to 94. Each Coax-Powered CAModulator installs using one RG59 or RG6 coax cable; both the camera power input and the video output share the same coax. It mounts discreetly behind any Decora style cover plate and connects to your existing cable wiring in minutes using an inexpensive splitter/combiner (not included).The video output is on a TV channel that you choose by setting a DIP switch on the modulator. It can then be distributed to all of the TVs in the home through the cable distribution system. No security monitor required. The CAModulator provides one of the most innovative solutions in residential camera applications. It is the world's only camera with digital RF modulator combination (patent pending.) This unique solution provides a "one-coax" installation where the power and video output for the camera share one coax cable. The output of the CAModulator is a television channel that can be distributed via a cable distribution system to all of the televisions in the home. No monitor is required. Each CAModulator kit includes the power supply and power injector to provide power to the camera. NetMedia CAModulators are FCC tested and compliant and can be used with all structured wiring systems available on the market.